The first time we set out to find this place (and by the first time, I mean: the first time after the four times I’d been there before while researching the first book), we got lost. 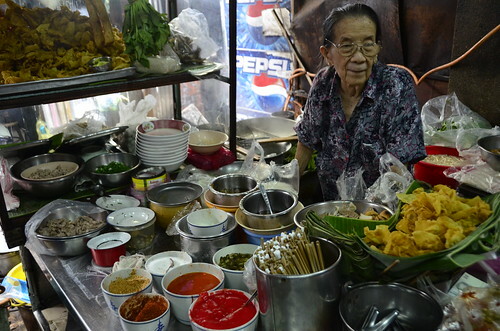 I thought this old Banglamphu standby — located deep in the bowels of a covered-walkway market specializing in bits of fabric and ladies’ undergarments — was located in Little India. Pahurat somehow figured in the location of the place, I knew (I am not very good at directions). All I needed to do was to find the outdoor market. Except … there are a whole lot of outdoor markets. All over Pahurat. 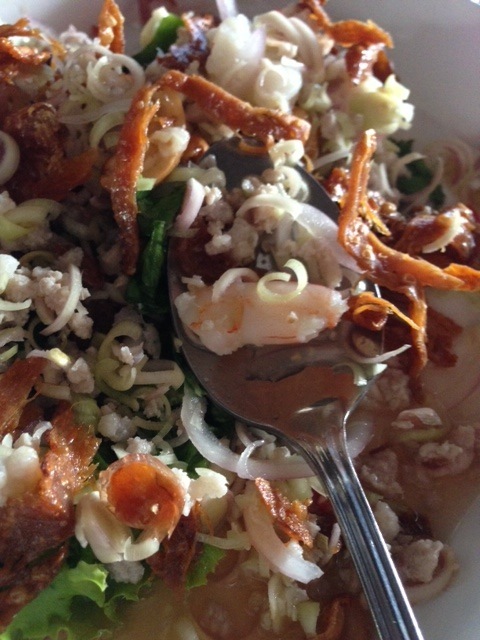 And all around Banglamphu, too. Because the second time, we were lost irreparably — this time in a random alleyway around the corner from the old-style shopping center known as Old Siam (incidentally, a great place for coffee, juices and a bathroom break if you ever find yourself in the area). The third time, I found it. And it was closed. And the fourth time, I forgot where it was and found myself in the same random alleyway again. Yes, I know. The fifth time, it was open, AND in the place we thought it would be (after going to the wrong market one last time. Because, we are us). It’s in a place called the Pahurat Market, yes, but really, how helpful is that? Better yet: across the street from the KFC at Old Siam (the actual KFC, not the sign, don’t use the sign). More specific? After crossing the street, turn right, and then turn the corner, and the market will be the first on your left. It’s a proper market — no listless little alleyway with cutesy stationery shop and a couple of sad old vendors selling incense here. It’s lined with fabric shops and jam-packed with stalls selling girdles and nightgowns and the odd touristy knick-knack or two. And it’s there — about 30 meters in to the left, or, if you want a shortcut, directly through the shop specializing in dancers’ traditional Thai headdresses and to the right upon exiting. If you are still confused, there’s the voice — the proprietor of the shop has a very distinctive voice that really defies description. 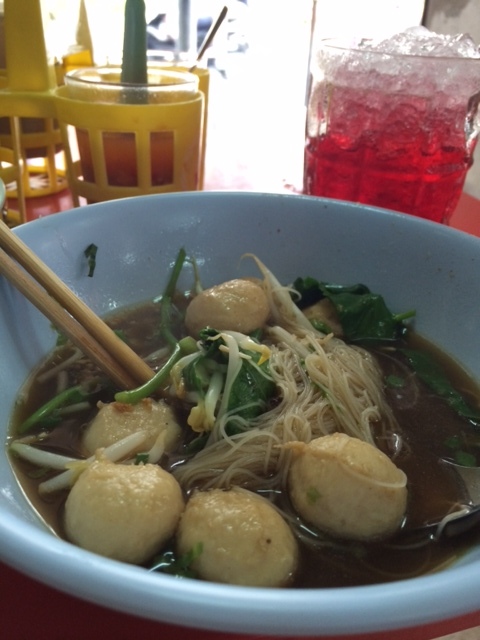 Any pedestrian within hailing distance will get an earful, exhorting them to come in and listing the specialties of the house: in this case, noodles, every kind, in a pork or tom yum or fermented red tofu broth. 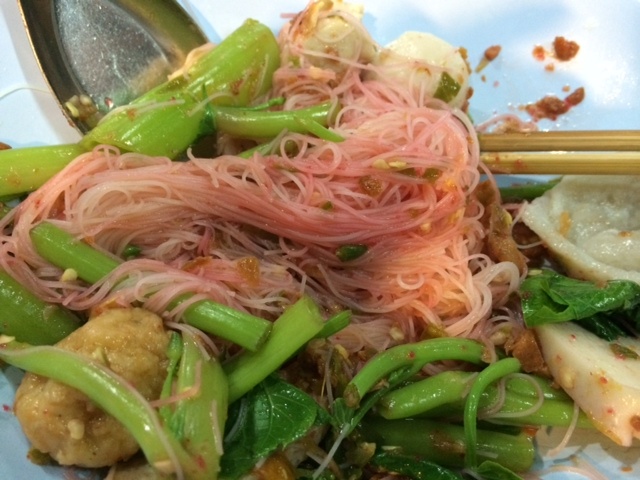 My favorite order at these kinds of noodle places is yen ta fo — the red fermented tofu-based sauce paired with fish meatballs, slippery slivers of squid, deep-fried pork bits and blanched morning glory — without broth or noodles. I don’t need the yen ta fo garnishes to have to share the spotlight. 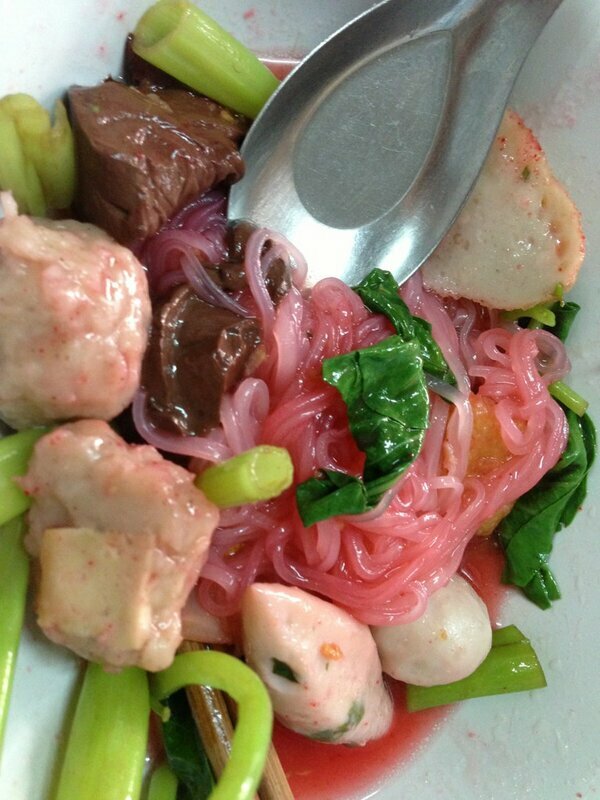 I find yen ta fo is a maligned sauce even among Thais, many of whom say they won’t eat it because it’s too sweet. I find that funny because, well, have you had Thai food lately? I think that the real measure of whether you’ve transitioned to becoming a true Bangkokian today is when you start sugaring your noodles. 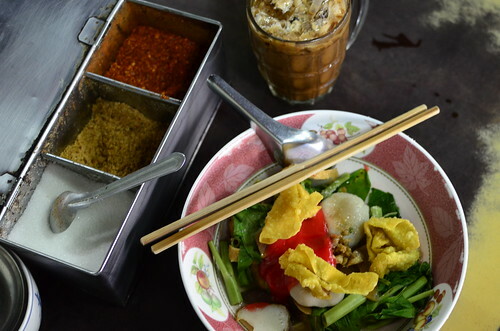 Anyone can revel in the dirty trashcan stink of fermented fish sauce or bomb their palates to Neverneverland with the typical assortment of chilies and spices … but it takes a true Bangkokian to add a heaping spoonful of sugar to all that drama. No longer can we have the savory without the sweet, and (maybe) vice versa. 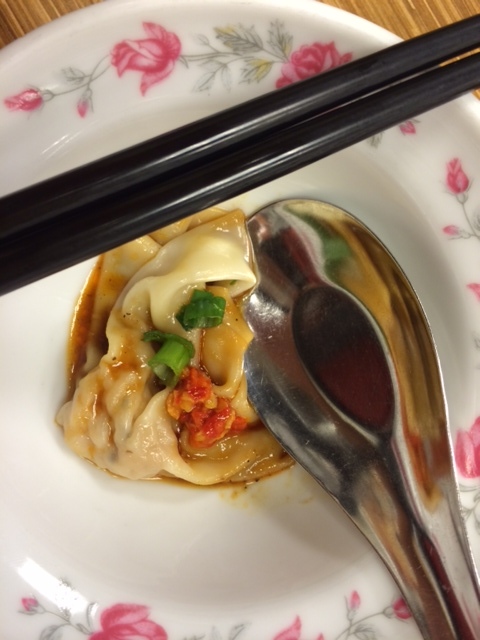 I’ll admit it: terrible yen ta fo is indeed too sweet. 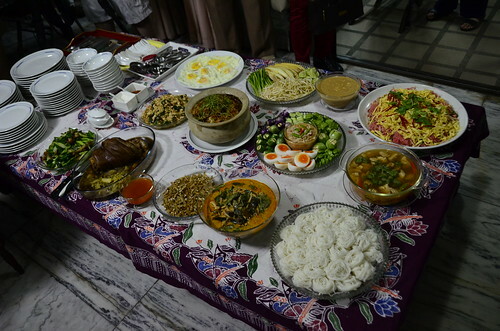 But the very best ones, like the bowl at New Chu Ros, throw in plenty of tart and a tinge of spice, making yen ta fo a literal party in the mouth of textures and flavors. So if you are intrepid enough to brave the Pahurat market, and willing to possibly get a little lost, try out the bowl at New Chu Ros. Girdle optional. It’s on. Stress has taken hold, and I am feeling overwhelmed. As deadlines loom and previously-unforeseen hitches suddenly rear their little heads, I find myself reacting in strange ways. Please don’t be alarmed. If you see me staring at you, I am not contemplating you for dinner. I don’t see you at all. If you are foolish enough to say something to me, do not be startled if I spout even more rubbish than usual. I am trying to work something out. In my present state, I have discovered some people enjoy my company more than usual. These are twisted and strange people. They are also food lovers. Because, in an attempt to keep from creeping as many people out as I usually do, I have retreated to the kitchen, where I can be as weird as I want and as brave as I like. It’s all OK, you see. My inevitable failures here won’t be as heartbreaking. And the results, as pitiful as they are, can be shared by everyone. 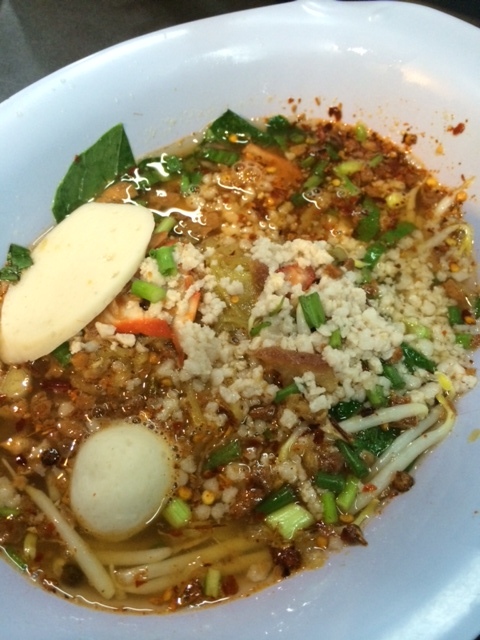 Today, I am attempting to replicate one of my favorite comfort foods, the bamee kai (egg noodles with, um, egg) from Bamee Slow, officially referred to as “Bamee Giew Moo Song Krueang” (open after 8pm at the entrance to Ekamai soi 19). Diners who like these noodles enough to queue up for them — and Thais have a hard time lining up for anything — affectionately call this place “Bamee Slow” because the khun lung (old “uncle”) manning the stall makes every bowl one by one, and it can take up to half an hour to get your order (for the record, the longest I have waited is 22 minutes). He has since stepped back from the soup vat and his daughter has taken over, and I am told she is a bit faster. But their noodles are as popular as ever. What I love are the al dente, silky noodles, coated with the unctuous yellow yolk that eventually spills out of every unlucky egg plonked into each bowl. 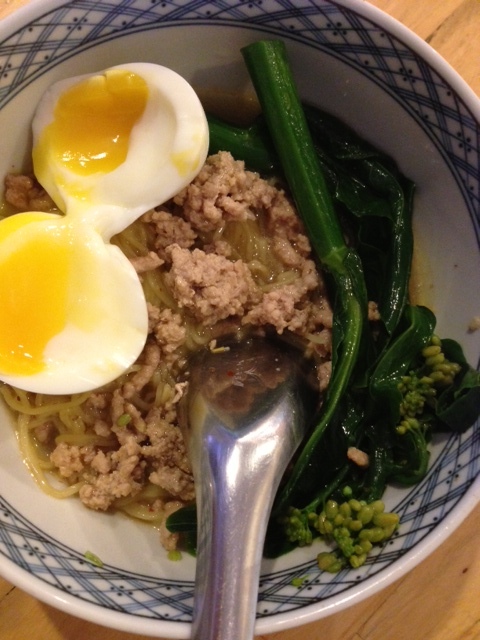 Slices of red pork, sturdy bits of Chinese kale, crumbled minced pork bits: none are immune from the reach of the yolk. This is what I am trying to capture, in my own small way. Before starting, you need to make sure you have a big enough strainer that will hold all your noodles while ensuring that all the starch washes away, so that your egg noodles are not a smooshed-up Jack Sparrow-like bird’s nest, rendering your entire bowl a sad mess like the remnants of my career. 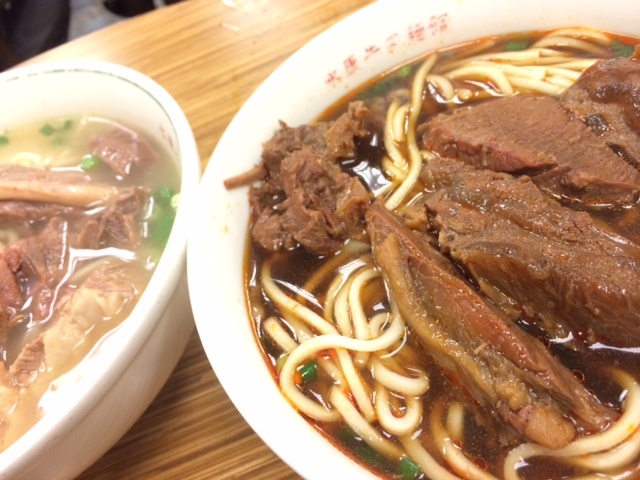 Also, like the people at Bamee Slow, you should make up each bowl one-by-one: it really does make for better noodles. 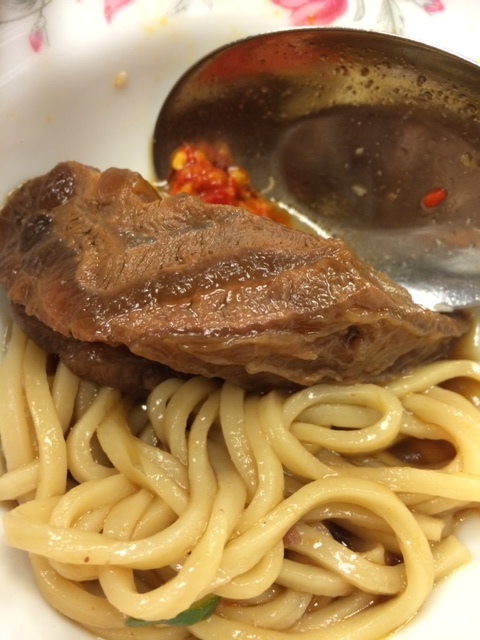 I boiled a handful of pork soup bones in water with some garlic and white peppercorns for an hour, skimming periodically, and then flavored the broth with soy sauce and roasted chili paste (the ingredient that I think lends the toxic orange color to Bamee Slow’s broth). 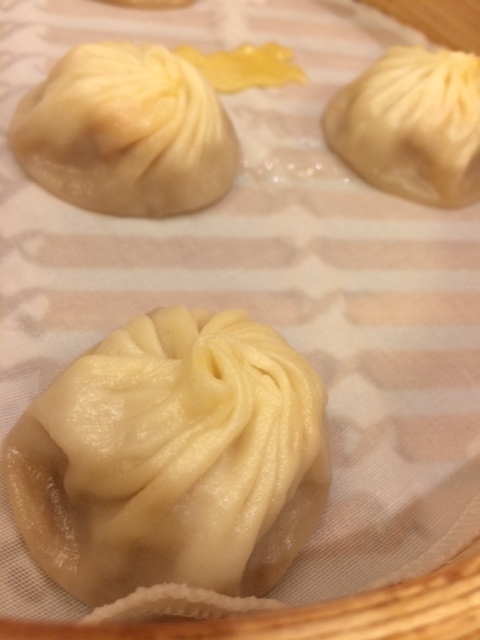 However, if you don’t have the time or inclination for this, pan-fry some minced pork with or without pork soup bones first, then cover with water and boil for a few minutes before starting. Or, simply get a couple of pork bouillon cubes into some hot water and proceed without delay. It’s all up to you. 1. Boil first four ingredients for an hour, skimming periodically. 2. Season with soy sauce, salt, roasted chili paste and more white pepper. Adjust to your taste. 3. Add minced pork and allow to boil for a few minutes until pork is cooked, skimming scum off of surface. 5. Place half of your noodles in a strainer and immerse in the broth, skimming more off the surface if needed. Wait 2-3 minutes for noodles to “cook” and lose their starch. 6. 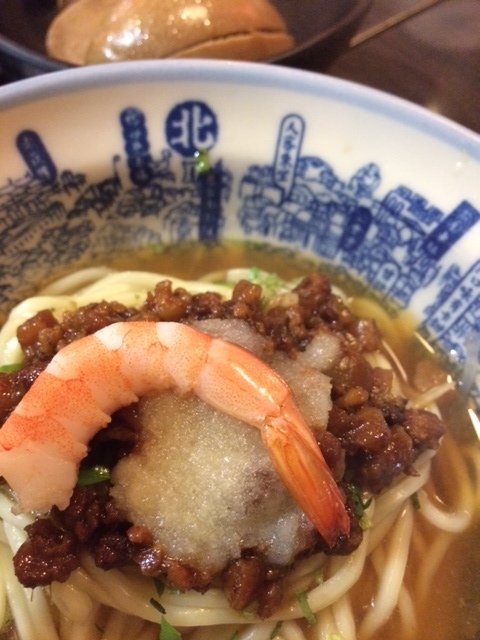 Place in a bowl and ladle broth with minced pork (but without pork bones) over the noodles. Garnish with egg and greens and, if you have it, a few slices of Chinese-style barbecued red pork. 7. 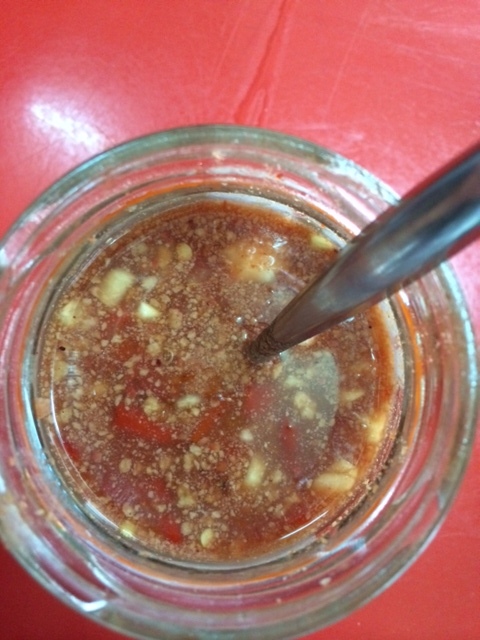 Serve alongside sugar, chili powder, fish sauce, white vinegar (with or without sliced or smashed chilies) and ground peanuts, if you like.